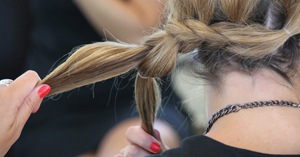 Half braid, half updo–this braided creation from Neroli Salon & Spa Hair Designer, Kendal is perfect if braiding isn’t your best friend. 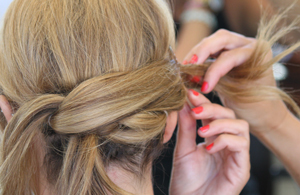 All you’ll need is your favorite hair spray, a few bobby pins and a package of clear hair ties. Don’t forget our rule of thumb–the messier, the better. Step 1: Like most people I like to add volume to my hair, so I added some lecture with curling iron and sprayed a medium hold hair spray and back combed the top section of my hair. Lightly comb out once you’ve teased. 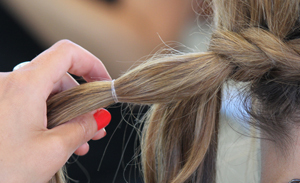 Step 2: Move all your hair to the side that has the least amount of hair and tie a little section of hair with elastic band about an inch or two above your neck. 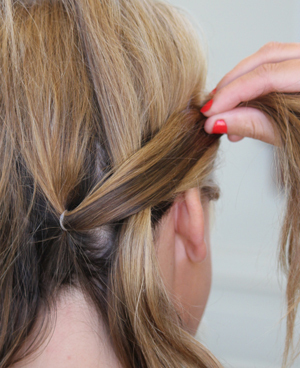 Step 3: Repeat step 2… take another small section and tie with an elastic band, so you’ll now have 2 small ponytails at the nape of your neck. 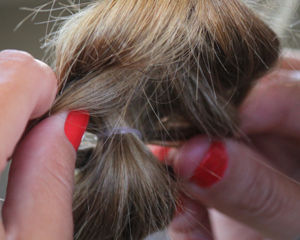 Step 4: Split first ponytail in half and pull second ponytail through the middle. Then clip it off to the side. 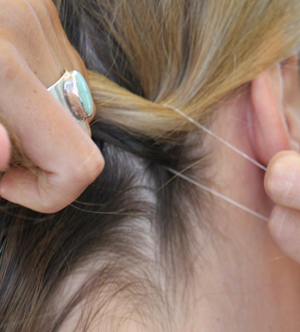 Step 5: Now use another clear hair tie and secure your pull through. Step 6: Now make another small section but this time you’ll add the hair into that section. 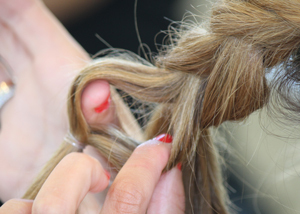 Remove the clip and repeat step four, splitting your ponytail in half. 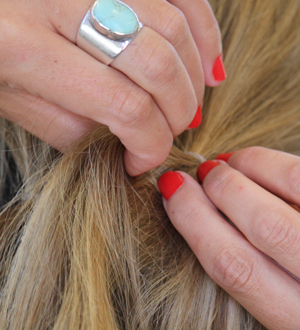 Step 7: Pull second ponytail trough and clip. Step 8: Then make another section and continue previous steps. Step 9: You can make anywhere from 4-7 sections depending on length, thickness of hair or how big you make the sections. 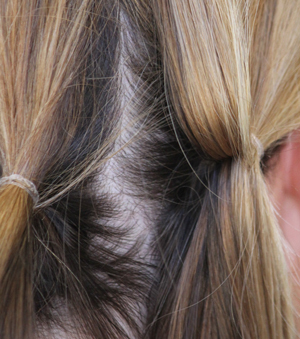 Step 10: Before taking the last section, take any pieces out you may want out around the hairline. I always like a few face-framing pieces. 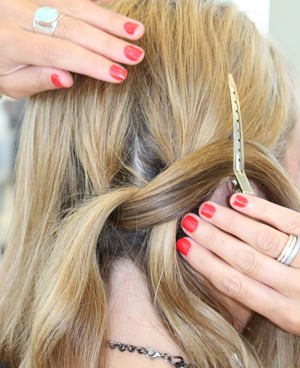 Step 11: Finish your last pull through with a hair tie. Step 12: Now the fun beings. 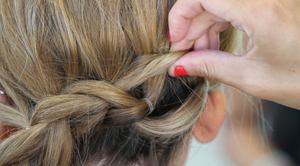 Go through and pull apart the braid. It helps if you don’t tie your elastic bands really tight, it makes it easier pull out the pieces. 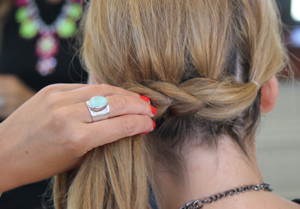 Step 13: Take the end of your braid and bobby pin under the length of the braid along your hairline. 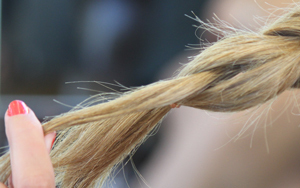 The braid should look with one continuous braid. Step 14: Finish with a medium hold hair spray. 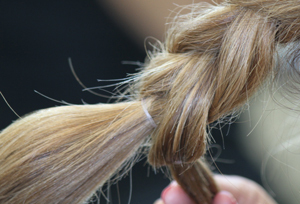 This blog was written by Neroli Salon & Spa Brookfield Hair Designer, Kendal. 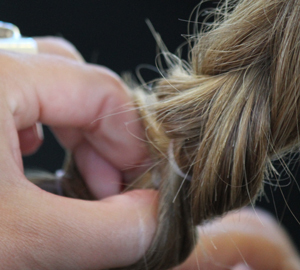 To schedule a hair service with Kendal, call 414.227.2888.